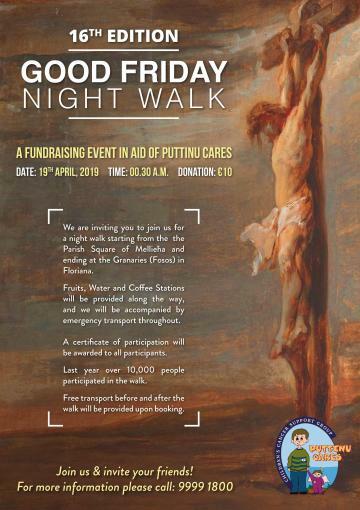 Organisers are expecting more than 10,000 people to put on their walking shoes and take part in an overnight Good Friday pilgrimage in aid of Puttinu Cares this year. The pilgrimage, which is now in its 16th year, sees people walking from Mellieħa to Floriana throughout the night. Last year, a record 10,000 people took part and organisers say they believe this year's walk will be even more popular. Participants donate a minimum of €10 to take part, with all proceeds going towards the Puttinu Cares Cancer Support Group. Last year's pilgrimage added €91,190 to the organisation's books. The night walk was started by Mellieħa resident Joseph Vella and his son-in-law Glenn, and has grown exponentially in the ensuing years. 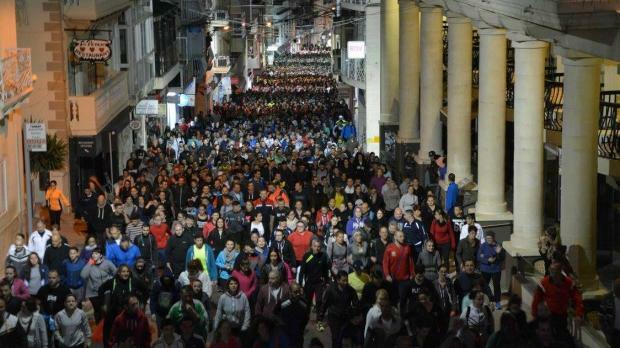 This year's walk will start at 12.30am sharp on the night between Maudy Thursday and Good Friday, with participants gathering outside the Mellieħa Parish square. From there, they will walk to the Granaries in Floriana, walking around 22km over an estimated four hours. Organisers will have water and refreshments available throughout the walk and participants can make use of free transport from the Granaries, starting at 10pm, to make it to Mellieħa. Minibuses will be available to pick up people who decide to stop the walk before completing it. For more information and to book transportation, call 99991800 or visit www.walkthewalk.org.mt .